RNC reportedly considering cutting off support for Trump in October. 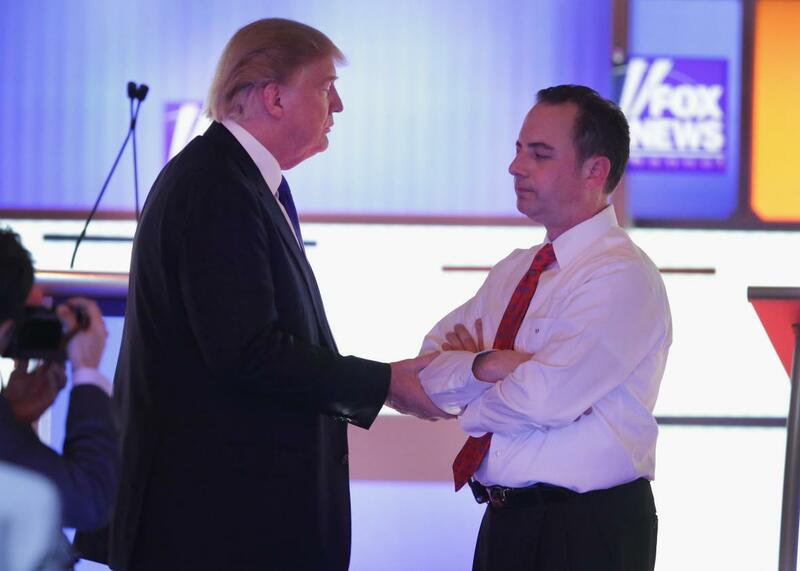 Donald Trump speaks with Reince Priebus, chairman of the Republican National Committee, at a debate sponsored by Fox News at the Fox Theatre on March 3 in Detroit. Republican officials may say they’re fully behind their candidate for the presidency, but in reality they’re laying the groundwork to cut their losses in October. According to Politico, party leaders have started talking about how they’re going to go about cutting off Donald Trump from party funds so the cash can be better spent in congressional contests. For now, the Republican National Committee is insisting that its support for Trump is in full force, meaning that the candidate only has himself to blame for his drop in the polls. There is a bit of disagreement among Republican operatives about when Trump could actually be cut off. Although mid-October seems to be the consensus, some say a decision may have to come earlier than that if the RNC actually wants to use the extra cash to make a difference in other races. “Early voting in Ohio starts in a few weeks, there’s a 45-day window for absentee voters, so mid-September would probably be the latest the RNC could redeploy assets and have any real impact,” one unnamed RNC member said. Still, it isn’t coming out of nowhere. Word of cutting off Trump comes days after news that more than 70 high-profile Republicans signed an open letter calling on RNC Chairman Reince Priebus to stop funding Trump and use the money for Senate and House races instead. “We believe that Donald Trump’s divisiveness, recklessness, incompetence, and record-breaking unpopularity risk turning this election into a Democratic landslide, and only the immediate shift of all available RNC resources to vulnerable Senate and House races will prevent the GOP from drowning with a Trump-emblazoned anchor around its neck,” notes the draft of the letter that was also first reported by Politico. Priebus has reportedly told Trump directly that he needs to make changes in his campaign in order to get it back on track, reports Time.